The 2005 brutal assault and murder of student Inge Lotz, whose body was found in her Stellenbosch apartment, remains unsolved. Strangely the National Prosecuting Authority (NPA) has closed the case - and shows no interest in hunting down Inge's killers. Also murdered in 2005 were Jessica Wheeler and Victoria Stadler, in Knysna. Heinrich van Rooyen was found guilty and is serving a sentence of 30 years imprisonment without parole - until 2035. He maintains his innocence and alleges that he was framed by the police. During a four-year long invesigation, an unseen hand in all three murders emerged - that of the late police Director Attie Trollip, who worked closely with the NPA. 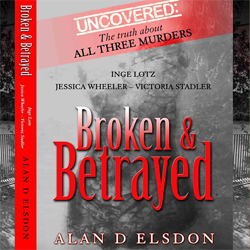 Order your copy of Broken & Betrayed here. Special offer only valid for delivery to South African residential street addresses. I recall two foreign workers (from Mozambique?) being mentioned in the initial reports as having worked/painted in the building on the day of the murder. But it seems they simply disappeared without being questioned. Surely they might have seen somebody? Can they still be traced? There were two lots of workers on the site that day: two tilers replacing broken tiles, and three generalconstruction workers. The tilers, both foreign nationals, had finished their job and left at about 1pm. They gave the police statements in which they stated that they had seen a white woman (presumably Inge) arrive at her apartment shortly before they left. Their fingerprints were taken and neither matched any fingerprints found in the apartment. The same happened with the three construction workers. They had left the site only at about 4pm. Two said they had seen Inge arrive in a siver Golf shortly before they left. The third had not. When at court the judge asked if they were going to be called as witnesses, the police said they were unable totrace them as their employer had closed down and they were foreign nationals that had probably returned to Mocambique or wherever. This was false. All three were locals. One of them that was said by police to have seen Inge arrive at about 4pm has since been traced by Elsdon. Alfred recalled having been interviewed by police on that day, but denied having given a statement at all, or having seen Inge arrive. If memory serves I think that David Klatzow was briefly involved in this investigation. Can anyone remember what his findings, if any, were? Is the name of "the guest" ("Mr X") divulged in Elsdon's book? No, "Mr X" is not identified, as much of what it is suspected he might have done is based on conjecture rather than provable fact. Family are amongst those that need to be more closely investigated / interrogated. I've read a book by Antony Altbeker "Fruit of a poisoned tree" - describing much of the botched "evidence" by the state's "experts" and also quoting verbatim from court records. The book ends with some surprising facts and other very possible suspects who were plainly ignored and "buried" in silence. This horrific crime is crying out for justice to be served.. There are many reasons to proceed with this matter. 1. To fully clear Fred van der Vyver's name in respect of the crime. 2. To bring the Murderer to court and to extract justice, he has no right to expect that poor police work should set him free. 3. Police officers and witnesses guilty of perjury should be appropriately dealt with! Inge Lotz deserves the TRUTH regardless of who is hurt in the process. The murderer OR MURDERERS (there were at least three different weapons used: a rigid blunt object such as a large spanner, a large rigid knife and a small sharp knife – perhaps even pliers to break her ribs – in addition to her probably having been hit on her nose and face with a fist). The crude brutality of the attack suggests extreme rage or, keeping in mind the atmosphere of mystery and maze of potential motives, could also be deliberate to hide very sophisticated planning. The book contains a fair amount of conjecture with which one might easily disagree, but there is no doubt that the police and prosecution handling of the case was scandalous. Honour and justice require that the police investigation is reopened, although the chances of finding new evidence so many years after the event is small.